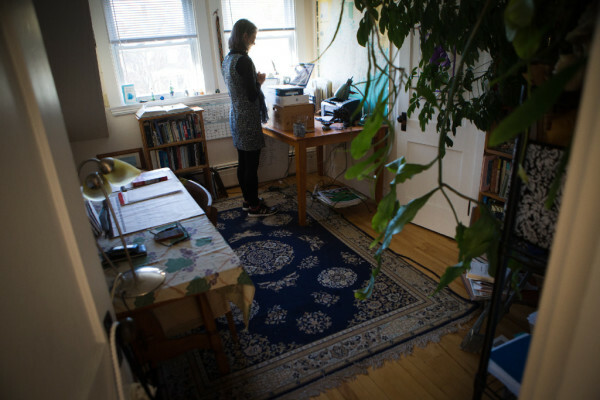 Standing near the window in her home office in Portland, Elizabeth Peavy teaches an online memoir writing class for the University of Southern Maine's Senior College on Monday. 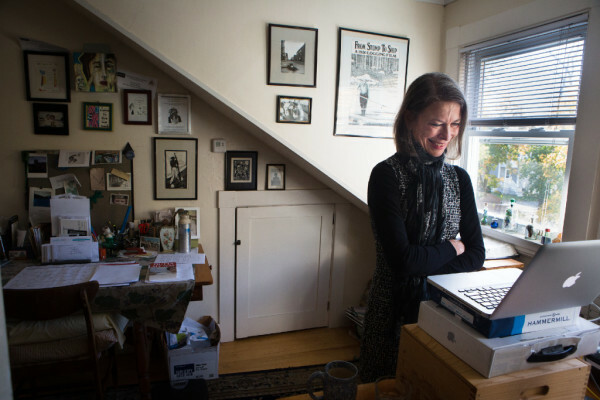 Portland writer Elizabeth Peavey convenes an online memoir writing class from her home on Monday. Peavey is teaching the class through the University of Southern Maine's Senior College program. 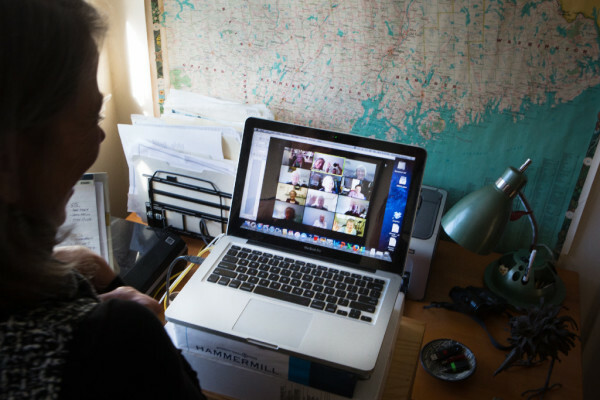 Elizabeth Peavy teaches an online memoir writing class from her home office in Portland on Monday. Peavey is a veteran writer of books, journalism and columns. Rachel Morin of Auburn adjusted her glasses, smiled warmly into her computer monitor and started to read aloud from the essay on her desk. “Ah, yes, looking at me now in the winter of my life, white-haired, with the ever-present eyeglasses, it is hard to picture how graceful and natural I once was on water skis,” she read, her voice unwavering. In individual small windows on her monitor screen, 10 fellow students of memoir-writing and their instructor listened attentively. Morin, who is 80, went on to describe a long-ago summer on a local lake with her boyfriend’s family, when there was an expectation that she would learn to waterski and love it and her cute new red-plaid, one-piece swimsuit showed off her trim figure with a narrow belt at the waist. She described her struggle to master the sport, the ignominious spills, how she plowed, panic-stricken, under the water “like a gigantic whale” and finally the elation of learning not only to remain upright behind the speeding boat but, eventually, to glide and spin like a dancer across the curling wake, in full control of her athletic young body. The assignment was to write a short essay — 750 words or fewer — with a theme of “You might not believe it to look at me now, but…” Each of Morin’s Maine Senior College classmates composed a similar piece. By design, only three would be read aloud and workshopped during the hourlong class, though all would be critiqued by the instructor. The other essays read that morning included a piece on rodeo bull-riding — by a man who suffers from a chronic disease that affects his muscle control — and one about a perilous kayaking adventure on a rough, 8-mile stretch of the Androscoggin River by a woman who has lost much of the strength in her legs. The Maine Senior College memoir course, available only online, is led by Portland-based writer Elizabeth Peavey, 57, who has had a long career as a personal essayist in Down East magazine and other venues. The group meets every other Monday morning and draws together aspiring older memoirists from across the state — Presque Isle, New Gloucester, Whiting, Auburn and more. On alternate weeks, the students meet in groups of three to work on their assignments. They use the online conferencing tool Zoom, which is similar to Skype and creates a casual, interactive environment without anyone having to leave home. A staff member from Maine Senior College helped the participants, many of whom are only passingly familiar with digital technology, install Zoom on their computers and showed them how to use it. Peavey, who lives in Portland, has been teaching the art and craft of writing memoir for more than 25 years, primarily through classes offered by the Maine Writers and Publishers Alliance. But more recently, she has been finding eager students in senior housing communities, at community centers, libraries and through Maine Senior College, a statewide network of eclectic, low-cost educational programing for Mainers 55 and older. “We all get to a point where we’re looking back more than we’re looking forward, assessing our lives as we go,” Peavey said. Memoir is a kind of personal history that is “memory-based rather than fact-based,” Peavey said. That means it is grounded in truth as interpreted through personal perspective and memory. Memoir is not the same as autobiography, a full-blown, fact-based life history. Instead, it asks the writer to focus on a specific event, story, relationship or period of time. Peavey’s ongoing reflections about her relationship with her mother, for example, recently coalesced into a 90-minute performance piece titled, “ My Mother’s Clothes Are Not My Mother.” The show has drawn appreciative audiences across the state and beyond, with an upcoming performance slated for Nov. 30 in Portland. “I have been writing about my mother for years,” she said, adding that the process of writing and reflecting over time helped her develop “deeper truths” about the relationship. Now, she’s thinking that her insight and experience may help family caregivers meet the challenges of caring for aging loved ones. Memoir can take the shape of short, standalone compositions, collections of linked essays or long, multichapter volumes. She also teaches writing, including memoir. In 2012, Wood took a break from writing the fiction she’s best known for and published her memoir, “When We Were the Kennedys.” It started as a short essay about the day in 1963 that her father died. But in revision, it grew to encompass the broader social landscape of the assassination that same year of President John Kennedy, against the backdrop of a major labor strike at the local paper mill that was the economic lifeblood of her community. Some had grown up in a factory town. Others had lost a parent or been raised Catholic or had a special needs sibling. “They would find some door to open into the book,” Wood said. Those diaries have proven a rich vein of story and insight, serving as the inspiration for Ford’s three published books of short essays: “Suddenly, the Cider Didn’t Taste So Good,” “This Cider Still Tastes Funny: Further Adventures of a Game Warden in Maine” and “Deer Diaries.” As the titles suggest, most of Ford’s stories are lightly humorous, but a few, including reflections on his experiences as a cancer survivor, strike a more serious note. Their “Two Old Cops” schtick draws a lively crowd to large and small venues, Ford said. While published memoirists such as Wood, Ford and Nickerson are connecting with readers through their work, the writers in Elizabeth Peavey’s online memoir writing class have other goals. Jackie Lowe, 70, moved from New Jersey to rural Washington County five years ago, along with her teenage granddaughter. She took an in-person memoir class through Sunrise Senior College with Peavey, who made the weekly drive to Lubec and got her started writing about the experience of raising her granddaughter. “Then I started thinking about other things in my life, and since then I have written many personal essays. I want to keep learning and writing. I may share some of it with my family, but it’s mostly just for myself,” she said. Joan Miller, 79 of Marshfield wants to write several personal essays, primarily as family keepsakes. Being in the class helps her sit down at her desk on a regular basis and hone her skills as a writer. For the recent assignment, Miller wrote about big-game hunting in Alaska when she was a young woman.